Guilt is a negative emotion that has serious impact on our physical and emotional condition. There’s no natural solution for what is a supernatural need. The world has no answer but in the work of Jesus we see how He dealt with guilt for us. You can live free - really free - from that gnawing sense of guilt that traps many. Listen & be encouraged! “What do people really need?Jesus promises that He will change you from the inside out. He will go right to the heart of the issue and transform us for good. That is what the cross is all about. When you see the cross it is more than a symbol - it is a reminder of the promise that Jesus has given you the chance of a quality of life that nothing else could never come close to. Penny looks at the building blocks in our earthy relationships that God has ordained for us to build our lives around. By studying the story of the Wedding at Cana she explains God’s heart for marriage, family and community and how He sets us up to win in life. She draws out the deeper symbolism in this well known passage and how it all points us to Jesus’ finished work at the cross. The place from which we are to live our lives. The church is a house of grace. In it you find blessing, favour and promises that you do not find outside. The church is also a place of physical, emotional and spiritual healing. Andrew shows how what we do today mirrors the early church and the people of Israel. We see Jesus and we are healed. Let the Lord enlarge your heart to see His church and your part in it the way that He does. A House of Grace - Part 3 - What’s pushing you in? Why would you ever want to build your life outside of a place where Jesus is the head? Headship means authority and that means that in the church everything is under the authority of the King of Kings! God knew every single challenge we would face in these times and He provided the answer. There is a grace that God has built into the church that you cannot find anywhere else - Andrew shows from the OT and the NT how you can find safety, protection & blessing in the church! Where do you find answers to the biggest questions and challenges that you face every day? Where do you go to? Whatever it is you will find the answer in Jesus.God has already made provision for you to experience rest and completeness in the church. That is His plan. There is a grace on the local church that is not found elsewhere. Discover a fresh new view of the gathering of God’s people - A house of Grace! What does your situation look like when you see it through the finished work of Jesus? What does grace do to transform it? Sickness when seen through grace become healed and whole. Discouragement becomes Hope. When you glimpse what the Lord is showing you about the transforming power of His grace then the next step is to be thankful and declare it. There is a power to thanks that releases grace in your life. Be encouraged! There is something innate within us to ask why! We want to know who am I and why am I here? In this weeks’ sermon, Phil dives into the Book of Ecclesiastes and explores how at the root of us all, we are looking for significance, meaning and purpose in life. Phil takes us on a spiritual tour de force, referencing Dostoyevsky, Nietzsche, Kets de Vries, Sartre, Camus and Augustine in an attempt to discover meaning in life under the sun. But above the sun, we get a different view – our attention should be on the ‘God-given task’ that fills our lives. There is a purpose to how we should spend our time – it’s not meaningless, it’s beautiful and God wants us to enjoy it! Today, look above the sun, look above your circumstance to see what God has for you in a life that is more than we could possibly dream, imagine or hope for! Ever been disappointed that despite saying words you did not yet see it happen? Allow the Lord to show us what His grace does in any situation then say it out loud. That is the difference. He will show you in your heart a revelation of transformation and then you declare it with your words. What do you want to see grace do? Imagine it and declare it! 2019 is a year where you will see the goodness and favour of God in areas that have been stuck. That requires faith - not in you and what you are going to do to see change but faith in what Jesus has already provided by grace. Jesus asks you the question - What do you see? God has given you the ability to picture and see what His favour looks like in changed around situations - what does it look like to be healed in your head? Restored? Andrew talks about faith comes and grows as we see through the lens of grace. This season is one of the promise of God's blessings pouring down like rain! God wants us to thrive, to live fruitful, purposeful and fulfilling lives connected to Him the source of all things. Today we live in a world crippled by anxiety and fear; daily messages, images and interactions seek to shape how we view ourselves and the world around us. Phil reminds us in this week's message that viewing any situation outside the perspective of God is to live in a world of random connections without purpose or meaning. As His children, God delights in us and wants us to be free from fear and anxiety so that we can enter the destiny He has designed for us. "God is speaking to us that 2019 is a year when the blessing of God will cause giants in your life to fall. Too many of us have lived under the shadow of a Goliath - life may go on, but it is way short of the promises that we receive through the grace of Jesus. Receive this word for 2019 and believe that you will see your giants fall." Rain in the bible always speaks of blessing. Many of us find it hard to believe for the future because we hold on to the past. That’s why grace matters. Before the torrent of blessings that God has for us He first send us rain (grace) to prepare our hearts - to free us, heal us and redeem us. Prepare yourself for blessing in 2019! Pastor Marcel was in Belfast to talk about how not only how to hear about grace but also how to receive the fullness that the message has to offer. But how does that work in real life? Marcel explains how your heart and life can be turned to grace through daily communion and how that picture of Jesus helps us receive. In the last part of this story we look at how Jesus takes people who are on the outside and brings them to a place where all that is His becomes theirs. This is not just for a few - It is what He wants for all - protection, security, rest & provision. When God starts something in your life He brings it through to that place - from grace to grace. Have faith for whoever is in your world that Jesus wants to bring them from being on the outside to fully joined with Him. Have you ever felt like an outsider? On the edge, not as good as.... Grace is for you. God is the God of the outsider. As we grow in grace we realise that a big part of growing up and maturing is when we see people who need grace and then know that we are the channel for it. It's not just grace for me but also grace for them. Be encouraged from the story of Ruth that grace brings you in. Many of us live with guilt about what we did that had a negative effect on other people - our children, friends, family. We all know our own shortcomings and often we can find ourselves looking back, wishing that we could do things again differently. This offering is a picture of Jesus - Law demanded restitution to be made for our sin against others - Jesus became that offering so that our guilt was dealt with and He repays the debt that you owe. Amazing picture of Jesus and His grace. There is a problem for you if you want to live in a way that is not fully set on the unmerited favour of Jesus in your life. Some Christians are still under the thought that they must do in order for God to do for them. Under that system you have a big problem - what happens when you intentionally sin? Sometimes we sin through ignorance but sometimes we choose it. What happens then? Under the law there is no sacrifice for that. That is why the blood of Jesus is so much more. So much greater than any of your effort or performance. Even at your worst He loves you, forgives you and blesses you still. The peace offering in Leviticus provided an opportunity for the Israelites to come together, give thanks to God and celebrate His goodness. This week Phil discusses the deeper meaning of the peace offering and how when we give God the best of ourselves we are freed to feast on His provision in every area of our life. This is an encouraging message that reminds us of God's daily provision. This week we continue the journey through the offerings in Leviticus and see how the sacrifices of the burnt offering and grain offering make it possible for God's people to celebrate the full, whole life of Shalom God has provided. Phil discusses how the symbolism of this rather unusual offering reveals that peace comes from the seat of our being and is revealed from the inside out. In part 4 of our Refresh series Phil discusses how Jesus is revealed in the grain offering. As we consider each of the elements of the offering we see different aspects of Jesus’ sacrifice for us and how we can be brought into relationship with God through Him. Be encouraged as you see God’s plan unveiled in Jesus’ life. Most believers live with the feeling that they should be doing better - struggling less, seeing more. Only a bigger, clearer revelation of Jesus can roll away the stone- the thought that we have to add to what Jesus has done for us. Andrew this week talks about how all of the sacrifices that people had to make were taken care of in the one perfect sacrifice of Jesus for you. So you could live in rest and live in more. To receive more grace, love & favour then you cannot be in the way! Our own self effort and performance mentality robs us of receiving all that Jesus has done for us. The bible tells us to roll away the stone - to get self out of the way so that life comes. Today Andrew shows us how Jesus' work rolls away the stones of the big areas in our lives - what He did was perfect - every time we see & understand more of His finished work for us then a bit of the stone is rolled away in our lives! Be encouraged! Do you want to experience more grace in every area of your life? The heart of God is that we know Him more every day and live in the goodness of the work of Jesus. How to receive more? Roll away the stone! Today Andrew shows us from the word what that means and why it will lead to more grace in you every day. So often we get fixated on reaching the destination yet God often has so much to reveal of Himself as we walk with Him. Sometimes our experiences can cause us to downgrade our expectations and our hope for the future. In this message, Phil considers the journey of two despondent disciples on the road to Emmaus who were able to build a greater understanding and relationship with Jesus as He walked with them. God loves to draw alongside us wherever we may be. As we see God's great story revealed in the person of Jesus, our view of life and vision for the future are transformed and our hope restored. Pastor Josh McCauley from Redemption Church in Johannesburg South Africa spoke this week at Exchange. Be blessed and encouraged by this powerful message ! Grace is more than encouraging words or good theology. Jesus wants you to access and live in the good of all His work. He told us to remember Him through communion - It is more than a symbol but a way of living in wholeness every day. 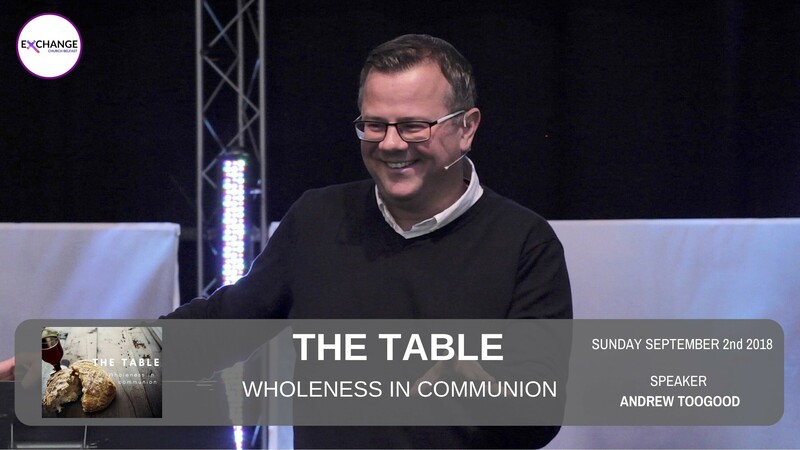 Learn the healing you can receive as you make communion a rhythm in your life and access more of the blessing of God in your life. Faith to possess - Part 9 - How to ground grace in your world. Finishing off our series on Faith to Possess, Andrew helps explain how to make faith a way of living and not just something that you hear and then move on from without living in the good of what Jesus has done. Powerful truths to help you ground grace and see the finished work of Jesus bringing good fruit on your life. Faith to Possess - Part 8 - See Jesus & speak in faith! There is a line of thinking in the church that says I just have to keep speaking and eventually I will see what I say. The problem is that many of us have tried that and still not seen things change. What then does it mean to speak in faith? The order in the word is we believe so we speak and Andrew looks at Peter on the water and how he responded in the middle of a storm that the disciples thought would drown them. You will be released, blessed and have faith grow in you as you listen! Faith to Possess - Part 7 - Does God count your doubt against you? Jesus was the only one to use the expression "you of little faith" in the Bible and he used it 5 times. For years many of us have felt condemned by this as it seems like a telling off from Jesus. Is that though what He meant? And what does Jesus do with you when you feel like you don't have much faith. You will be blessed to know He is not against you! Where do you start to possess the promises that God had made for your life? The word tells us that we should guard our heart because that is where life flows from. So what does that really mean? How do you do that and how do you know what is in there already? Andrew looks at where the word tells us how we can start to see the goodness of God flowing in our lives as we see how God has written the word to show us what faith looks like. So often we think faith is something we need to try to work up or increase. In this week’s talk Phil reminds us that faith is the response to the discovery of who Jesus is. Encountering Jesus and His grace frees us to step into all for which we are called. Phil uses David’s response to Goliath as an example of how faith changes perspective and how others’ do not always share your view of circumstances. Be encouraged as we recentre on Jesus as the the source of all things. For many Christians trying to battle our way to the truth of the Gospel has often been like playing Blind Man’s Buff. We end up confused and disoriented – wanting to do the right thing but ending up disillusioned, unhappy and thinking all the time that God is disappointed in us. We listen to others, we try and seek advice but too often it’s the blind leading the blind! Father God wants to direct our lives never leaving our side as He takes us along a path of faith. Let this message encourage you to understand and recognise that faith in the Creator is never blind but based on the truth of His word. God does not make promises to you that He does not keep. Many people even when they hear about the gospel of grace feel inadequate or frustrated that they do not see more of the fullness in their experience. 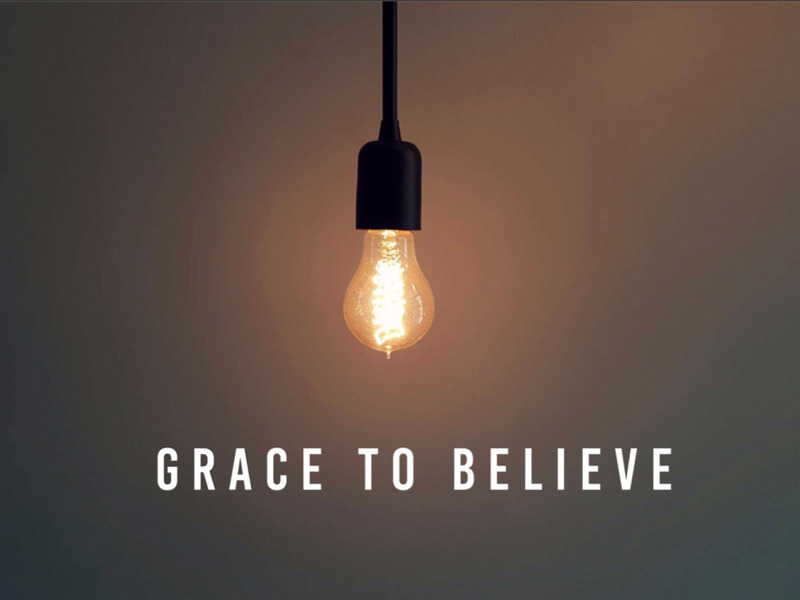 Andrew starts a new series looking at how we have faith for breakthrough because of grace. Faith is the result of grace and not because of you. Find freedom this summer! God is not surprised, taken unaware or disillusioned by anything that you do. He knows everything about you and He loves you. God knew exactly what He was doing when He sent His Son to save you and it gives Him great joy that you are His. This week Phil reminds us that Jesus sees us as we are and when we encounter Him, we can not only see our true selves but also see who He has made us to be. Be encouraged as we remember God's unfailing love and everlasting kindness. Centred - Part 10 - Instead of judgement, see Jesus. In the last of this series we see Jesus and His work for you in the brazen altar of the tabernacle. David had a revelation of the 4 sides of the altar and how it revealed Jesus who was to come. This was a place of sacrifice for sins and the never ending reminder that you could never be right with God - until we see through grace the hidden pictures of Jesus and how he would be one sacrifice forever! - be free! That is the big issue - we can know something in our heads but what about in our hearts - because that is where we live from. God wanted you to know from the very beginning that He see light & perfection in you - if you consult God like they did in the tabernacle using the mysterious Urimm & Thummin that is what you find. You need to know what God really thinks of you - that revelation will change your life forever. God wants you to know that you are secure forever. That means every day. When we are insecure about His love for us then fear rules us. But even back in the Old Testament He gave us visual reminders that the work of Jesus would make us secure - from today and for eternity! Do you have doubts that God's love for you changes with your performance? Listen & be encouraged! Centred - Part 6 - No sweat - You are righteous ! Sometimes we hear words so much and we do not really know the power they have for us - righteous is one of those. It means to be totally acceptable to God. In the tabernacle we see what it means for us today, hidden in the clothing that the Lord told the High Priest to wear. This has such power for you today as it shows you how God wants you to receive from Him! Be blessed! Jesus and His work to rescue us has always been at the centre of God's plan - He wants you to live with Jesus at the centre of your life and when we do that there is a whole new level of life to be lived. In the tabernacle every single detail tells the story of Jesus who was to come & this week Andrew shows us how the colours used tell you an amazing truth that if you will allow to touch your heart, will bring such and peace & blessing - Grace changed you forever and you are never going back! The attention to detail in God's design of the Tabernacle is amazing. This week Phil considers how the boards,bars and sockets of the Tabernacle structure paint a fantastic picture of the church. As believers we are lifted up, covered in righteousness, held together by grace and ground in His atonement. Jesus is at the centre of all we do and the Church, as His body, gets to be part of God's plan for the world. What is the point of your life? Seems like a big question. Most people ask themselves or think about it often. Grace shows you your purpose and in fact God hid that truth way back in the Old Testament and it is really very simple. You can discover today how grace can bring you right into the centre of God's purpose when we see the typology of Jesus in the Menorah - The lamp in the tabernacle. This is a great truth that will free you from self and discover the wonderful freedom of discovering your purpose in grace. If you ever struggle to stay in faith that God has every detail of your life covered then this is a talk for you. Andrew looks at how God always wanted you to have the finished work of Jesus at the centre of your life - the picture of the mercy seat and how that was a foreshadow of where we are today - made undeservedly righteous. When you see the detail that God went to thousands of years ago you can be so assured that He has you covered today! You are righteous!